I wanted to share our master bedroom with you. I've recently completed the wall in this room, and though the room overall has more growth to do, I'm excited about how this project has elevated this space. I love perusing decorating blogs for inspiration and when I came across this idea, I knew it was perfect for our master bedroom wall. This blog is one of my favorites. Emily is very talented and she uses her talents for the glory of God. When I saw her office wall I fell in love. Wallpaper is making a big comeback and I love the look but can't afford the expense. This wall project cost me $2.50! That's it! And it gave me the look of wallpaper on a dime. Here's how it went down. First I copied Emily's template, (follow the link). Next I cut out the shape and traced it onto a manilla folder, then cut this shape out again. This became my stencil to trace on the wall. Emily suggests using spray adhesive in a light coat on the back of the stencil. I did this initially but spray adhesive is such sticky business (no pun intended :) ), and I found that I really didn't need it once I got into my groove. When I was ready to begin tracing on the wall, I used a level to make one vertical line from floor to ceiling. I chose to make my line where my wall peaks. If you don't have a vaulted ceiling eyeball a spot about in the middle to draw your vertical line. At the top or bottom of your line place your stencil on the wall so that the plumb line goes directly through it, then trace away. If you check the straightness of your line after you've done a few rows it will probably be off. DON'T try to correct it. As long as you follow your pattern no one will ever know. If you try to correct yourself the flaws become more obvious and you will only become frustrated.Once you have traced your stencil in pencil its time to paint! I used craft paint from Hobby Lobby in a color that coordinated with my wall color. Use a thin brush and follow your pencil lines. If your paint isn't flowing as nicely as you want it too (its getting too globby) add a little bit of water and shake your bottle up. You will notice that my wall differs from Emily's. She had more patience than I did. :) I intended to do the double effect that she did but because my spacing between the stencils wasn't perfect, the only way to correct it was to paint it singly. Hopefully the pictures help explain this better. If you want to do it the way she did, keep a close eye on your spacing and keep it consistent. I realized this when I was done, and after 8 hours of stenciling, I wasn't going to go back. I still love how it turned out. Oh my goodness this is gorgeous Jody! You did an amazing job, talk about getting "bang for your buck!" Can I suggest you link this up to Inspiration Friday as well as your kitchen. We don't mind people linking up a few different posts, people love this type of thing, I bet you'll get some visitors for sure for this post! I love this!! You did an awesome job. Saw you over at At The Picket Fence and I had to stop by. It totally makes the room. I am your latest follower. I'd love for you to stop by and say hi and consider following me back as well. Thanks so much. I'm off to check out the rest of your blog. Great job, I know that took a lot of time. I partied right after you at picket fence. Love your room. You did such a great job with your stenciling! It really does create such interest in your room. Your bedroom is beautiful! 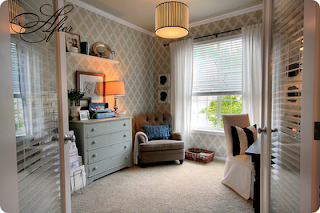 I absolutely love your stenciled wall...it turned out great! I found your blog from the 2805 blog party. I'm your newest follower. If you get a chance, I'd love you to stop by my blog & maybe follow along too! You did a terrific job with your stenciling! I must have taken a lot of patience, but it sure paid off! Beautiful! Thank you for sharing your creative project at Potpourri Friday! Love the stenciled wall! I've been wanting to do something like this on the headboard wall of our bedroom, but can't afford to shell out big bucks for a stencil ;) Thanks so much for the inspiration and the link to the stencil template! out there that I'm totally confused .. Any suggestions? Many thanks! I don't drop a comment, however I read a lot of remarks on "Master Bedroom Wall Project". I do have 2 questions for you if it's okay. left by brain dead people? :-P And, if you are writing on additional online sites, I would like to keep up with you. this blog, this weblog is actually amazing. Spot on with this write-up, I absolutely believe this web site needs far more attention. I'll probably be returning to read through more, thanks for the info! Hi Dear, are you in fact visiting this site daily, if so afterward you will absolutely get good knowledge. Excellent blog you have got here.. It's hard to find excellent writing like yours these days. I truly appreciate people like you! Take care!! My spouse and I absolutely love your blog and find nearly all of your post's to be exactly what I'm looking for. I wouldn't mind composing a post or elaborating on a number of the subjects you write with regards to here. Again, awesome site! What's up to all, how is all, I think every one is getting more from this website, and your views are pleasant for new people. like Wordpress or go for a paid option? There are so many options out there that I'm completely overwhelmed .. Any recommendations? Appreciate it! Link exchange is nothing else but it is only placing the other person's webpage link on your page at appropriate place and other person will also do similar in favor of you. I'm gone to tell my little brother, that he should also pay a quick visit this weblog on regular basis to get updated from most up-to-date news update. how a user can know it. Thus that's why this piece of writing is outstdanding. Thanks! great publish, very informative. I wonder why the opposite specialists of this sector don't understand this. You should continue your writing. I am confident, you have a great readers' base already! This sort of clever work and reporting! Keep up the awesome works guys I've added you guys to my own blogroll. I am extremely inspired with your writing abilities and also with the layout for your weblog. Anyway keep up the excellent quality writing, it's uncommon to peer a nice weblog like this one nowadays..
to say that I've really enjoyed surfing around your blog posts. After all I will be subscribing to your rss feed and I hope you write again soon! Greetings! Very helpful advice in this particular article! It's the little changes that produce the most important changes. Thanks for sharing! It's in reality a great and useful piece of information. I am satisfied that you shared this helpful info with us. Please stay us up to date like this. Thank you for sharing. genuinely good, all be capable of easily be aware of it, Thanks a lot. I've an incredibly good uncanny feeling I discovered just what I needed. I so much undoubtedly will make sure to don?t disregard this site and provides it a look on a continuing basis. Asking questions are truly nice thing if you are not understanding anything fully, however this paragraph presents good understanding yet. house to unravel my problem. May be that's you! Looking ahead to see you. that here every data is quality based information. There's certainly a great deal to know about this subject. I really like all the points you made. Hi there to every one, for the reason that I am truly keen of reading this blog's post to be updated on a regular basis. It contains pleasant material. Hello to all, it's really a fastidious for me to pay a quick visit this website, it includes valuable Information. as I'm wanting to create my very own blog and want to know where you got this from or exactly what the theme is called. Kudos! on the internet. I am going to recommend this web site! and engaging, and without a doubt, you've hit the nail on the head. The issue is something that too few folks are speaking intelligently about. I am very happy that I stumbled across this during my search for something concerning this. I'm really enjoying the theme/design of your weblog. Do you ever run into any browser compatibility problems? A small number of my blog visitors have complained about my website not operating correctly in Explorer but looks great in Firefox. Do you have any ideas to help fix this problem? I was almoѕt moveԁ to start my oωn blog (well, almοѕt. thаt, how yοu preѕented it. Too cool!